IT is well and truly motor show season, with not one but two massive motor shows (New York and Seoul) currently overlapping each other to reveal some amazing new models, and concepts to the world. 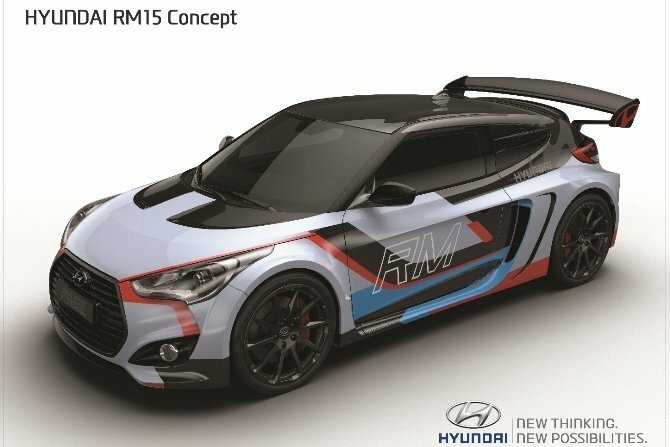 At what could be deemed the local show for Korean car maker Hyundai, the covers have come off its latest mid-engine model, an aggressively-styled high-performance coupe concept named ‘RM15’ (Racing Midship 2015). The lightweight two-seat concept, unveiled at the Seoul Motor Show, makes a confident statement about Hyundai’s passion for performance and its expertise in the development of advanced vehicle technologies. The RM15 features an aluminium spaceframe as its core structure, with a covering of light, stiff body panels formed in carbon-fibre reinforced plastic (CFRP), which together help to achieve a significant weight saving compared to a conventional all-steel vehicle. The body panels are painted in the signature colours of the company’s ‘N’ (pale blue, black, red and Hyundai mid-blue) which also feature on the Hyundai WRC i20 rally car. Based on the Veloster RM shown at last year’s Busan Motor Show in Korea, the new RM15 features a host of modifications that boost the latest model’s performance, handling and efficiency. Total weight is reduced (to 1,260kg), weight distribution is more evenly balanced (43% front, 57% rear), the centre of gravity is just 491mm from the ground and aerodynamic downforce is 24kg at 200kph, aided by a competitive lift-coefficient. Power comes from Hyundai Motor’s Theta 2.0-liter T-GDI engine mounted transversely behind the two-seater cabin and ahead of the rear axle, ensuring optimised weight distribution and a low moment of inertia for excellent handling agility and high levels of traction. New, vertical air-intake slots in the flanks of the car, ahead of the rear wheel arches, increase cooling airflow within the engine bay and enhance powertrain efficiency. The body panels, named ‘Hybrid Lightweight Body Structure (HLBS)’ provide further demonstration of Hyundai Motor’s expertise with carbon-fibre reinforced plastic structures. With an aluminium core structure and CFRP body panels, the RM15 is light yet extremely strong, with torsional stiffness of 37,800nm/deg. The impressive specs make for what could be a fantastic package, if it were ever to be produced. The concept does however demonstrate just what Hyundai is capable of, and what can be put into race packages in the future in terms of technology.